Accessorize your bedside with this cherry veneered nightstand. Built with strength and durability this accent table will last you for years to come. The night cabinet is constructed with one drawer and one shelf with large opening. The drawer operates on full extension drawer guides with steel ball bearings that provides easy one-handed smooth operation and greater drawer stability than standard center mounted drawer guides. Underneath the drawer, the shelf is a great tool to organize reading material and other personal decor. Hardwood frames with protective panels help keep accessories such as clothes dust free. The back panel is recessed and attached by screws that provide additional strength. Lamps, alarm clocks and pictures are great accents on top of the "root beer" colored wood. Not only will this small end table add an unique appearance to your bedroom but will also be extremely functional. 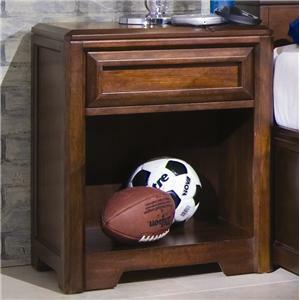 The Elite - Expressions Night Stand, Drawer and Shelf by Lea Industries is available in the area from furnishingretailers.com. 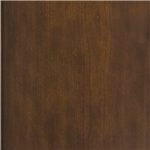 Finish The finish is a rich, "root beer" color with matched Cherry veneers on case tops and beds. Lead free child safe finishes that meet all US safety requirements. Handles & Hardware Heavy drawer frames act as handles to open drawers. Drawer / Shelf Construction Drawers feature full extension drawer guides with steel ball bearings that provide smooth operation and greater drawer stability than standard center mounted guides. Hardwood frames with protective panels between each drawer help keep clothes dust free. Drawer Suspension Drawers that extend completely out of the case provide more useful storage space with easier access to the contents of the drawers. Drawers also feature automatic drawer stops to prevent drawers from falling out of the case. Description: Top Veneered cherry tops. Case Construction Constructed from hardwood solids and select cherry veneers and with wood products. Back panels are recessed and attached by screws providing more strength and structural integrity than stapled on back panels. Warranty Lea products are warranted to the original purchasers from authorized Lea dealers for factory-related defects (materials and workmanship) that appear under normal household use for a period of one year from the date of shipment from our factory. Browse other items in the Elite - Expressions collection from furnishingretailers.com in the area.